This post was originally published in Nov 2013, and pictures were added Dec 2016. These snickerdoodles were and will continue to be classics. 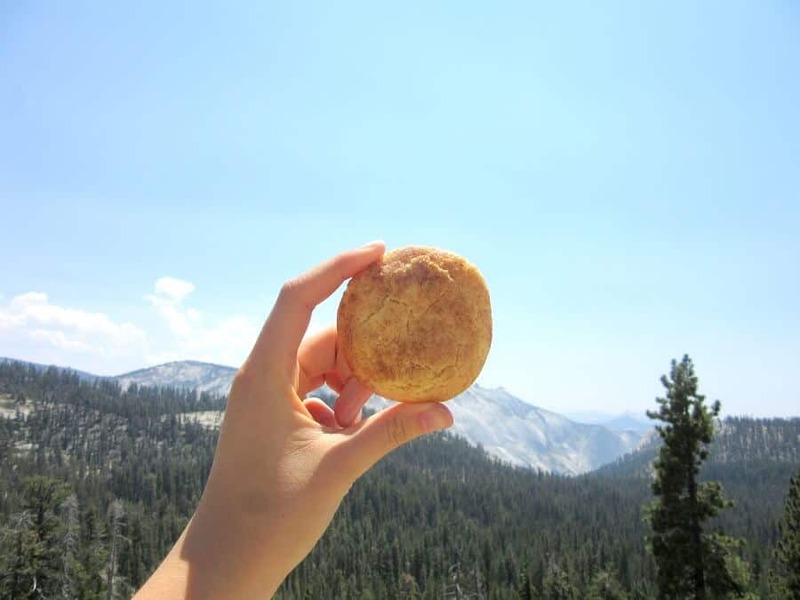 The pictures you see here were taken during summer 2016, and you can see Yosemite in the background (though it’s not Tunnel Vision or anywhere well-known; kind of forgot about the cookies at those stops). If you’re up (or down; isn’t it weird how people can agree/show their willingness to do something by saying that they are “down,” but that originally the phrase was that they are “up” to do it?) to play around in the kitchen, try using powdered sugar instead of granulated in the coating. I did it this past time, and found the cookies to have crisper exteriors, though who knows if it was from the powdered sugar or something else. Confounding factors? Maybe. 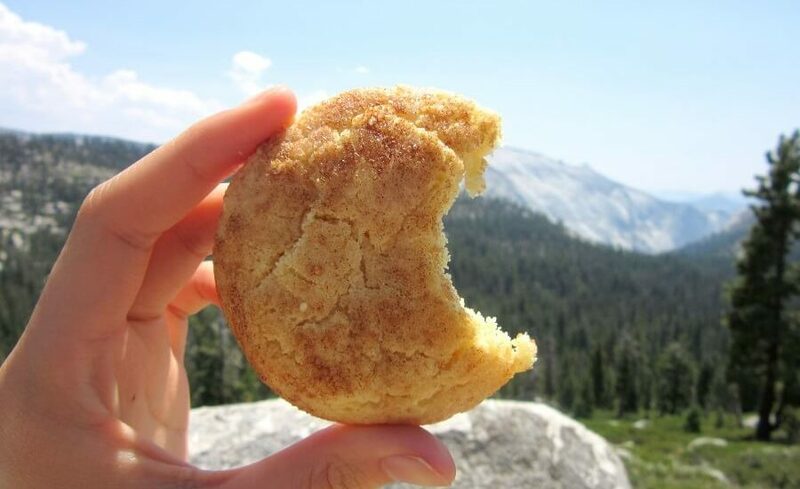 These snickerdoodles are pretty darn amazing. I’ve made them countless times. They have always turned out perfectly. Sometimes my butter is too cold. Sometimes I set the oven to the wrong temperature. It doesn’t matter. The cookies are buttery. They are crisp and crunchy on the outside from the cinnamon-sugar, and have a tender crumb on the inside, not unlike a good French fry. 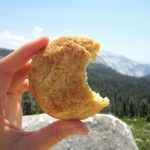 I have never made another snickerdoodle recipe, and I don’t plan to. If you are feeling down and uninspired, bake up a batch of snickerdoodles. They work anytime of the year, especially if you have a yearning for spice and cinnamon. They’re comforting and soothing and perfect for fall and winter. Snickerdoodles are basically sugar cookies rolled in cinnamon sugar, but they're more than that. The cinnamon sugar caramelizes and gets crunchy, and providing the perfect counterpoint to the tender cookie insides. Mix the butter, sugar and eggs until well combined. Add the flour, cream of tartar, baking soda nad salt; mix just until combined. Shape into 1” balls (I like portioning the dough out with a cookie scoop, and then rolling the bits into balls). Place the cinnamon sugar in a shallow, wide bowl and roll the dough balls in it. Place a couple inches apart on a silicone baking mat or parchment lined baking sheet. Bake at 400F for 8 to 10 minutes, until the cookies are set and light golden brown around the edges. Cool for a few minutes on the pan, then transfer them to a wire rack to cool completely. From Betty Crocker’s Cooky Book. I love those recipes that turn out great even when you don’t do things perfectly- these snickerdoodles look heavenly! same! or sometimes i just pass it off as intentional 😂 ie the time i made caramel frosting but the caramel recrystallized so i said i stirred in caramel bits. thanks kate! these are perfect for when i have to cater to kids/an unknown audience but i still want something tasty. Love these pics (seriously, Yosemite!!! <3 ) and I love, love snickerdoodles. Thanks for sharing these again–definitely saving for our cookie exchanges!! yosemite is so pretty! maybe even prettier than cookies (gasp i know). Yumm, I need to try these! they’re so easy and so tasty! perfect for holiday baking and sharing (or hoarding, that works too 😉). i hope you try them! I love the comparison of these cookies to fries because I absolutely LOVE fries!!! If they’re as good as you say and they sound foolproof then I wanna try them out myself! Do you make any other cookies as well?? i make all sorts of cookies! i probably make these, chocolate chip (my biggest things: chop the chocolate yourself so you get irregular bits of chocolate melting everywhere, and chill the dough overnight if you have time!) and sugar cookies (with oil and butter so they get super buttery and crumbly) the most though. I totally love them..Nice !! !